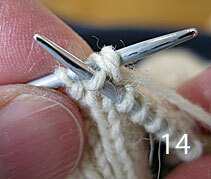 Anyway, you now have to get the stitches off the holding yarn and onto a double-pointed needle. 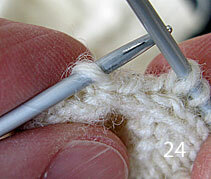 Thread a needle (hereinafter “Needle 1″) through half a dozen or so stitches on the left side of the gusset (2), slide the yarn out from those stitches (3) and re-tie the yarn to prevent any stitches dropping off when you’re not looking (4). 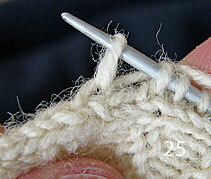 Drop a good length of the end of the new ball of yarn you’re going to knit with into the armhole (5). (I tend to go for long ends of 4-6 inches to keep them out of the way, but that’s a bit excessive, I know – so long as you’ve got enough to darn them in at the end, that’s all you really need.) 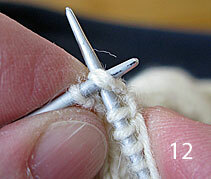 When you’re happy with the length of your yarn end, hold it in position by anchoring it between thumb and finger (6) to ensure a good tension on your first stitch – otherwise it will be too loose and you’ll end up with the dreaded hole, as mentioned above. 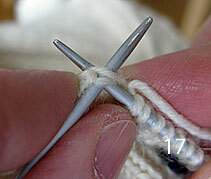 Insert another double-pointed needle (hereinafter “Needle 2″) through the first stitch (7), and knit a plain stitch in the usual way (8-10). And there you are. 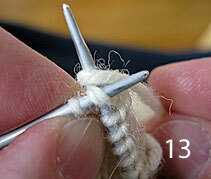 No sewing involved at any stage. 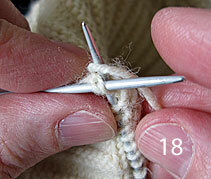 My pattern tells me to pick up 160 stitches around the armhole including the gusset. 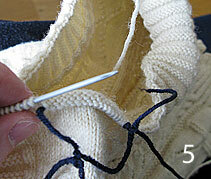 I’ve done this and the sleeve is massive – looks like a puff sleeve! 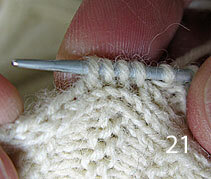 The pattern band is over 92 stitches once the 20 stitches of the gusset is worked out. What am I doing wrong or is it the pattern? 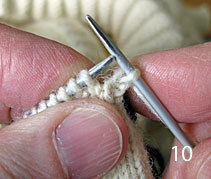 I am knitting a size 44 inch Staithes gansey. Sorry not to get back to you sooner—sometimes in the working week I just lapse into a coma on the sofa in the evenings from which I have to be shifted with a broom handle. Can you drop me an email at gordon@ganseys.com with as much information as you can (depth of armhole and stitch gauge would be most useful and we’ll see what we can advise). By which I mean I’ll get Margaret on the case! Not sure if I posted my question so will try again! Many thanks for your help. 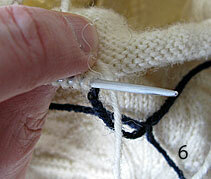 Thanks particularly to Margaret – the sleeves now look like sleeves and the Gansey is now finished. Just the lose ends to darn in! Without your great website I would have been very ‘stuck’. 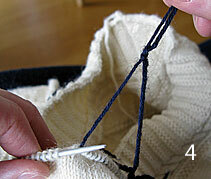 I might even knit another one! Glad we (ie, Margaret!) could be of help. Sorry not to reply sooner, but we were away and I’ve been knocked out with a cold this last week. And remember, if you’d like to send us a picture of your gansey, we’d be happy to add it to the gallery. 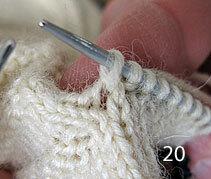 Is the stitch that is knitted into when picking up for sleeves part of the 100% count of stitches (for the chest)? 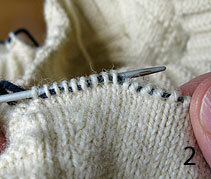 Or do you increase one stitch on either side of the front and back panels after half the gusset is created? I hope this isn’t a stupid question. Hi Tony, not a stupid question at all! 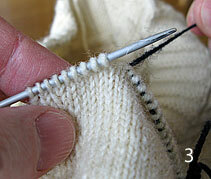 I usually have one plain stitch either side of each of the fake “seam” stitches that run up the length of the body, which is extra to the stitches i need for the pattern, and when I come to pick up stitches around the armholes I use that one to knit into. In other words, yes, it’s part of the 100% count of stitches for the chest. But there’s no reason why you can’t increase a couple of stitches front & back when you divide for the yoke, it’s really up to you. I guess the important thing is to make sure that the stitches you knit into aren’t part of the pattern, so you’re not losing anything by it. 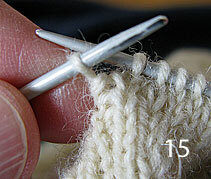 Like Sue Rees on the above comment, I had worked out that 160 stitches to be picked up for the sleeves would be about right, but I now think that is far too many and the sleeves would look wrong.. I,m knitting for a 40/42 inch chest with a tension of 9 stitches and twelve rows to the inch. I’m afraid that I need Margaret’s help here too. 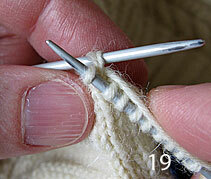 The number of stitches will depend on the depth of your armhole. If it’s 9″ deep, then 160 is about right (18 x 9st/” = 162). 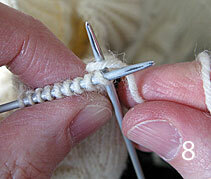 This does not include the gusset stitches. 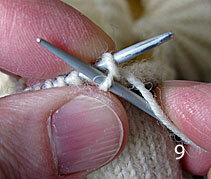 If it’s 8″ deep, then this will be too many stitches. Hope this helps, get back in touch if you have further queries. Thanks again Margaret. Couldn’t fnish this gansey without your website. 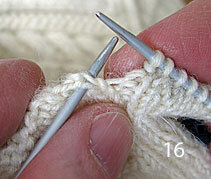 From where do u pick the stitches? From the front and back? Of the jacket? Hi Suzanne, it’s hard to advise as we’re not sure exactly what you’re describing. Could you drop me an email at gordon@ganseys.com and we’ll do our best to help! 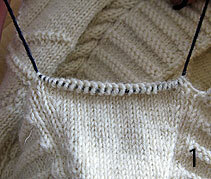 I knitted all the way up to the neck on cicular needles and incorporated a knitted steek. Hence I didn’t have an “edge” to pick up. 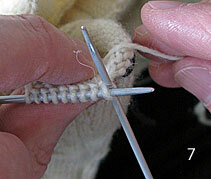 In the end I decided to use a crochet hook to pick up every stitch on my chosen line. 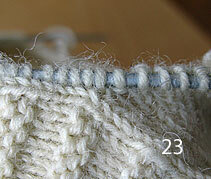 Then knitted 2 together every 4th stitch to avoid the bunching. 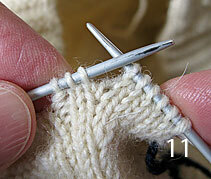 It appears neat but I’m only on my first full sleeve row so cannot tell what it will look like. Fingers crossed or it’s yet more unpicking.I have found that with a vertical pattern with columns of knits and purls plus cables the gansey is much closer fitting than I anticipated so I’m hoping that the sleeves will not be too small. I’ve already had to chop the body in half and re knit starting the gusset lower down to make the arm holes longer – I added the gusset length onto the sleeve measurement rather than the gusset width! 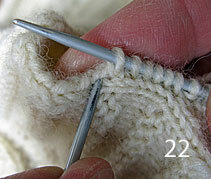 Grafting 292 stitches to join back up to the original knitting was no fun. Hi again Deb, that sounds like quite a project! One thing, blocking the gansey might well solve the tight-fitting issue. Although it’s not exactly a cure-all, vertical purl rows can pull the gansey in, and when I put one on as soon as it’s finished it’s often a rather tight fit. But once it’s been washed and blocked and dried, although it relaxes back a little, it’s still looser than it seemed.